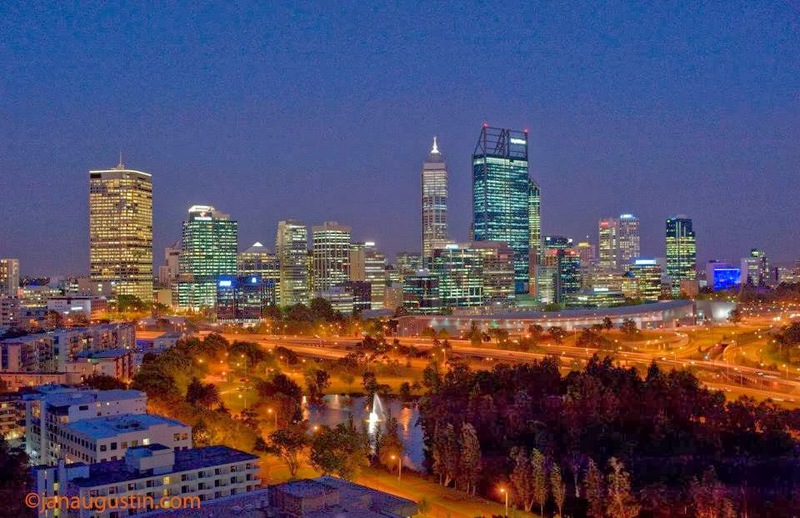 In the 80s I was a kid growing up in Perth, arguably the most isolated city in the world. But isolated didn’t mean we missed out on fun (or if we did, we didn’t realise – there was no internet back then, and much less FOMO!). One of the highlights of the year was our nearly-annual chance to visit the Perth Royal Show. So what is the Perth Royal Show? 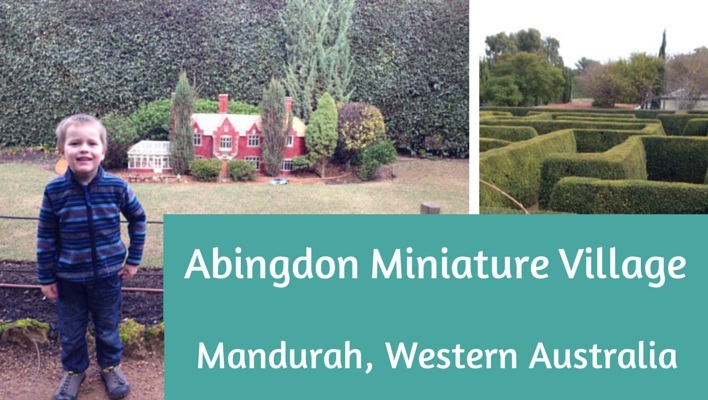 It’s really an agricultural show, although it’s definitely gone way beyond that – but it’s still run by the Royal Agricultural Society of Western Australia. (On the way there yesterday I heard some young train passengers discussing why it was called royal – “because the queen doesn’t come, does she?” – but as a Commonwealth country we still have HEAPS of stuff with “royal” labels, and we probably always will.) It happens every year in late September/early October – it runs for a week during our school holidays and always gets a LOT of visitors – mostly locals but I think tourists should come along too! Anyway, the original basis of the show is farmers bringing their best animals and produce to Perth from all corners of Western Australia and competing to be named the best. That includes arts and crafts and thanks to them, my sister and I got to regularly visit the Royal Show as kids – my mum was involved with a little-known craft (dimensional weaving) and was a judge there a few times, so in those years we had free tickets – perfect! 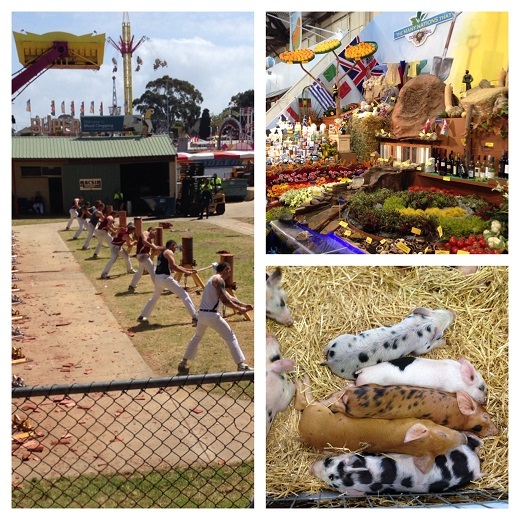 Wood-chopping, regional agricultural displays and multi-coloured piglets at the Perth Royal Show! I love exploring the pavilion with all the regional exhibitions – and all the contest stuff is cool too. I read somewhere that thanks to all the cooking reality TV shows lately, there are more and more entries in the cake decorating and baking categories – I love that! I actually have no idea from a farming perspective if a win in a category at the Royal Show (best pigs or woolliest sheep! – okay that’s not an actual category but you get the idea) has an impact on the business of the farm but I’d like to think so. Of course the show has long since evolved to be about more than agriculture. There is a massive Sideshow Alley area with lots of games to play (my son hasn’t discovered these yet and at four he is never going to win a game of skill so I was happy to avoid this area this time – plenty of years for that in the future). 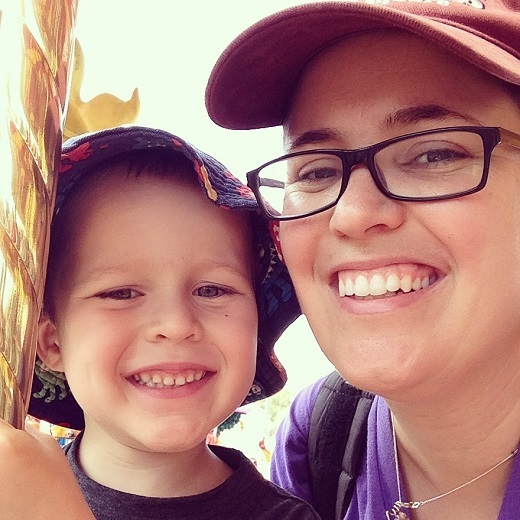 And of course there are all the rides – roller coasters and a ferris wheel and those scary rides where you get tossed around and turned upside-down which I’m afraid are not for me at all, but plenty of people there enjoyed them. We stuck to the merry-go-round (phew). And then there are regularly scheduled events each day – some in the main arena and the most spectacular being the nightly fireworks (which we didn’t stay for this year – but when my son’s able to stay up past his usual bedtime without too many consequences then we will!). There are various performances for both kids and adults and the weirdest one to me this year was the racing and diving pigs. My son and I had read about the racing and diving pigs ahead of time and happened to be in the right place at the right time to get a front row seat (it was free – you just had to get your timing right, as you can see the crowd got quite big). Now, I have somewhat mixed feelings about the ethics of this but I have to admit it was rather entertaining. There were two races of four pigs each around a short track, and then two pigs came up the ramp to do the big dive into the pool. Odd, right? 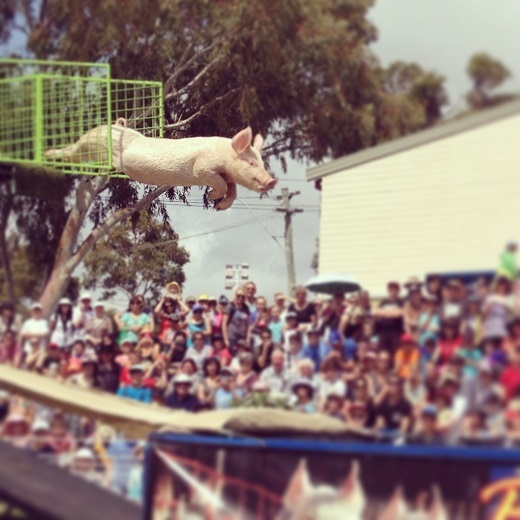 Anyway, it turns out that pigs actually can fly so now I guess anything at all is possible. Why should tourists visit the Perth Royal Show? 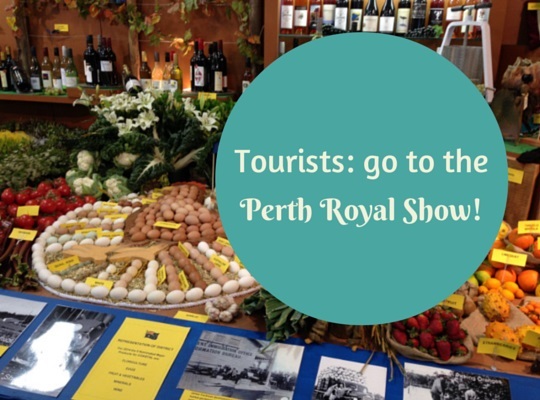 I think if you were visiting Perth at show time (early October) and asked locals, a lot of them would tell you the Perth Royal Show is “just a local thing” and not really suggest that tourists would get much out of it. But I reckon they are totally wrong! A visit to the show is an eye-opening look at our local culture, as well as a way to get an understanding of Western Australia’s history. Correct me if I’m wrong, Perth readers, but the Royal Show has a sentimental place in the hearts of all Perthites, a bit like Rottnest Island does. It’s an event where pretty much everybody is happy (with the exception perhaps of a child who wasn’t allowed to buy a fourth show bag or go on another ride) and because it coincides with the start of spring it’s often at a time when we are emerging from our winter (which is pretty mild compared to the rest of the world but we still like to complain!). Everyone’s happy at the Perth Royal Show! Tourists who visit the Perth Royal Show will see Perth people having fun, and they’ll see what makes our state tick – you’ll see the importance of agriculture and mining and more. And there are cute animals – even baby emus in one of the animal pavilions this year, in all their stripey gorgeousness. 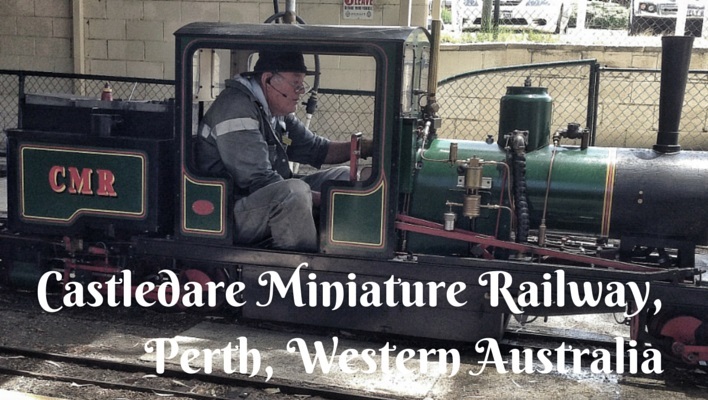 Anyway, if you’re visiting Perth at show time, I’d seriously consider a day out at the show. 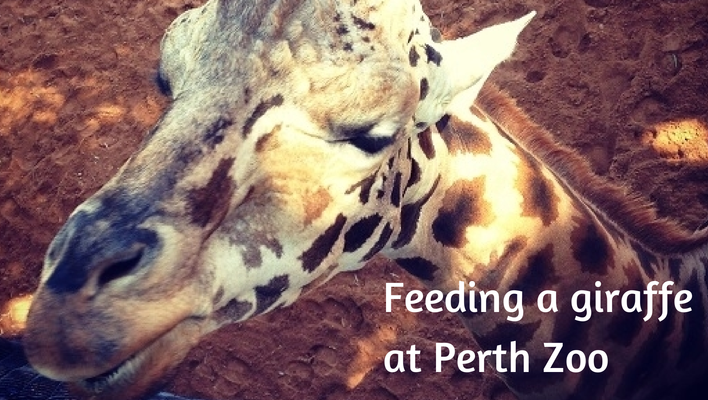 It’ll make your trip to Perth different to most tourists and that’s something I always aim for! I’m linking up with the fabulous #IGTravelThursday crew – check out the posts below for more gorgeous travel posts that started life on Instagram. Yes The Royal Show has a sentimental place in my heart…I was just saying when we went the other day that as a kid I used to love getting the book that had all the showbags in it…so I could do a BUDGET of what bags I could afford. Yep. Destined to be an accountant. Oh yes Hilary, the big parade is fun – didn’t get to it this year. That’s amazing you went to the show on your first day in Australia!! Interesting introduction! Reading your descriptive write up of the Royal Perth Show has made me want to put it on my list of things to do for next year because I used to love county shows when I was a child growing up in England. Memories include The Royal Windsor Show where I competed in a junior show jumping competition and was eliminated at the first fence, right in front of the Royal Box – my pony refused, 3 times, to jump the fence and the bell clanged 🙁 Then there was the Bath and West which had stalls and displays for miles it seemed as a kid, probably much like the Royal Perth. I laughed so much at the incident of you and your sister in her dog-get-up on the dodgems – it’s the way you tell ’em! Oh dear, what a naughty pony you had Jo! Oh yes, the dog head incident was a good one, glad you enjoyed it! Oh Alison I can imagine! Must remember to check out some state fairs when I finally get to do my big American road trip! Ooh, I want to see a flying pig too! Looks like a really fun event to visit. It was heaps of fun Reeta – and yes the flying pigs were bizarre!! That flying pig shot is CRAZY. I can’t believe it. I’ve never knew there was such a thing. Right with you there Leigh – new to me too! So fun.